Explore the Virginia Aquarium and See What You Can Find! For seafaring explorers, both young and old, the Virginia Aquarium & Marine Science Center has a little something for everyone. With over 800,000 gallons of exhibits and animal habitats, there&apos;s a lot to explore among the museum’s fresh and saltwater displays. The marine science center’s primary goal is to inspire conservation through education, research and sustainable practices, making it one of our favorite things to do with kids in Virginia Beach. Bring the whole family out for a day of learning about the habits and wildlife that surround us and what we can do to help protect them. You can sign up to take a behind-the-scenes look at the daily operations, join its award-winning stranding response team to help rescue and learn more about our local sea life, or join in on the team’s efforts to build new oyster reefs. There are two main exhibit buildings, the Bay and Ocean Pavilion and the Marsh Pavilion, which are connected by a ⅓ mile nature trail through the Owls Creek Salt Marsh. Together, the two buildings house thousands of animals representing over 300 species, many of which come from the surrounding waters and marshlands of Virginia Beach, including sea otters, harbor seals, loggerhead sea turtles and even sharks! Check out the gnarly teeth of the endangered Tomistoma freshwater crocodile, come face to face with a sea turtle, or stick your tongue out at a Komodo dragon. There’s no shortage to what you can find at the Virginia Aquarium. 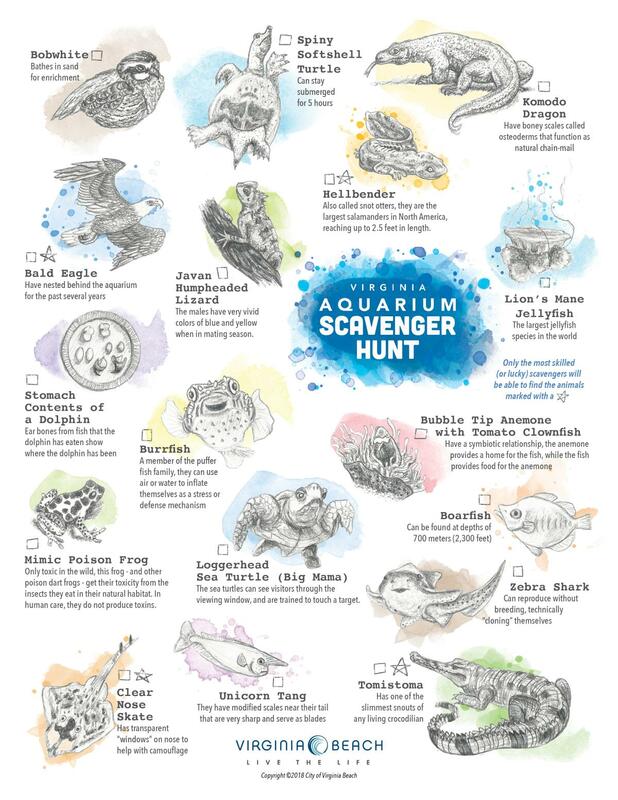 Print our scavenger hunt below and see what all you can discover during your trip!